DPS has just released a new addition to their Wailer family: The Wailer 106. The Wailer 106 will be available in DPS’s “Pure3” construction, and it is also available in DPS’s new “Foundation” construction. The Foundation construction is a reworked version of DPS’s “Hybrid” construction. I won’t go too deep into the construction right now, but suffice it to say that we’re looking at similar materials laid out a bit differently: bamboo and poplar + fiberglass and carbon. DPS is positioning the Wailer 106 as a ‘do anything’ ski, a one-ski quiver. Width wise, the Wailer 16 falls right between the DPS Wailer 99 and the Wailer 112RP, and those two skis will provide some useful reference points. One more thing: DPS is positioning this ski as best suited for Intermediate-to-advanced skiers, and I think that’s right. But hopefully my comments throughout this review will flesh out what that means, and I’ll say more about this in particular in my “Who’s It For?” section. There’s quite a discrepancy between the tips and the tails of the Wailer 106 in the “Foundation” construction (will refer to this ski going forward as the Wailer “F” 106). The tails are on the stiffer side, call them a 7 out of 10. The shovels, however, are quite soft—call them a 4, and maybe even a 3 out of 10. Take the Wailer F 106’s dimensions, flex pattern, and sidecut radius, and you know what you end up with? A 106mm-wide ski that carves the @!%# out of groomers. 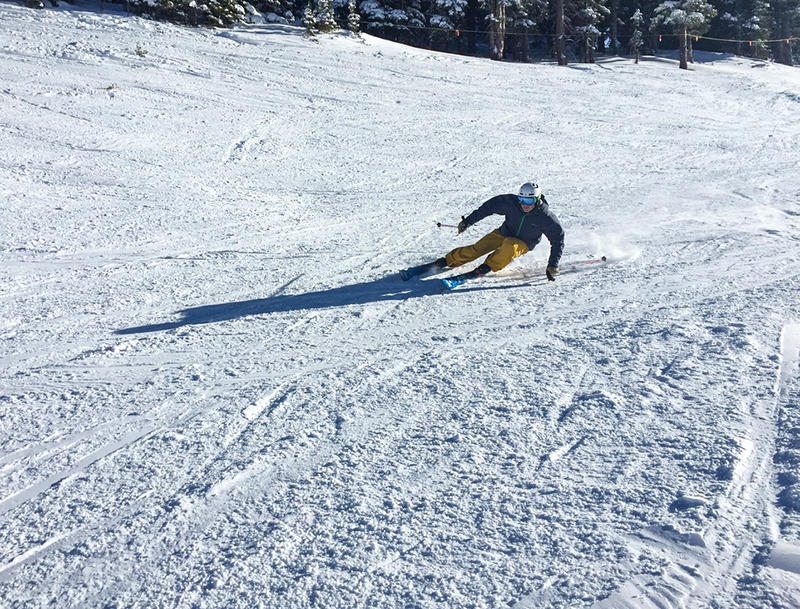 I really can’t overstate this: on decent, fairly smooth groomers, this ski feels as good carving turns as some of the sub-90mm-wide skis we’ve reviewed. Jonathan Ellsworth on the DPS Wailer F 106, Taos , NM. Of course, the more roughed-up or icy the groomer gets, the less the width, flex pattern, and relatively short effective edge of the Wailer F 106 will be advantageous. So no, this isn’t going to replace your dedicated hard-snow skinny carver. The Wailer F 106 wants to be on edge, all of the time. It skis short, so you can make quick, snappy turns on the ski, but it’s also comfortable running out medium-sized turns, too. And if those groomers are a bit soft and in really good shape, I found that I could drive some pretty massive, stupid-fast turns. The Wailer F 106 definitely does have a speed limit (unlike the Wailer 105 Hybrid T2), but it is a high speed limit, and aside from the Wailer 105 Hybrid T2 battleship, this Foundation 106 has felt better and more damp to me than any DPS ski I’ve been on. So if high-speed GS turns (50+ mph) are your top priority, I don’t think this is your ski. But if you have strong technique and a willingness / ability to work a ski, I think you’ll have a very, very good time on groomers on the Wailer F 106. On piste is where the ski got the biggest “WOW” out of me. 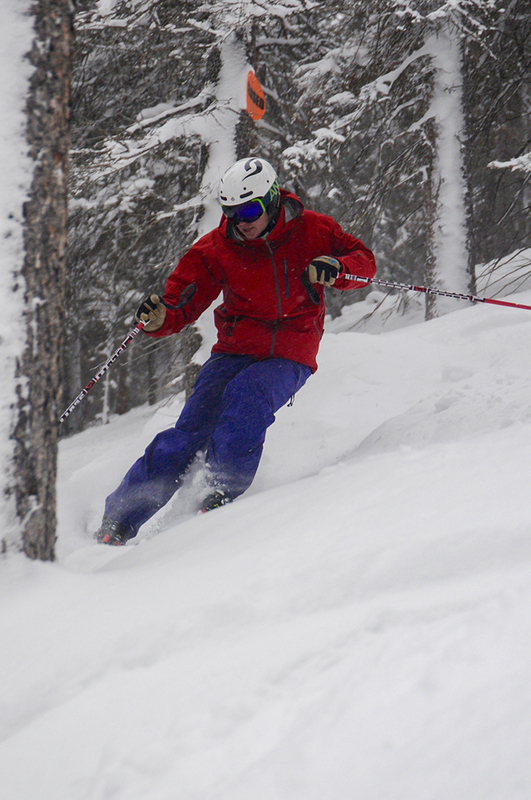 The Wailer F 106 isn’t a zipper line machine; the ski has too much sidecut for that. The more you detune the tails, however, the more easily you will be able to slide / smear the tails through bumps rather than carve (and finish) your turns through moguls. But if you are willing to let the ski do the work (rather than bash your way through bumps with a lot of speed), and you carve around moguls at more moderate speeds then I’d say that the Wailer 106 is pretty compliant. Work with the ski, don’t force it to try to power through terrain. All-in-all, if you are looking for a ski to make bumps as easy as possible, I think there are easier options. But if you already feel fairly comfortable in bumps and you take a more measured approach to them, I think you’ll get along fine with this ski. The Wailer F 106 feels quite at home in shallow chop and crud, as well as smooth conditions—whether smooth windscour or smooth, consistent pow. The Foundation construction feels much less reactive than DPS’s “Pure3” construction (their very lightweight construction that very much prefers smooth, consistent conditions. By comparison, the Foundation construction is much more comfortable in everyday, resort conditions—it’s really not even close—and in the relatively steep trees of Taos’ Pollux, the Wailer 106 easily handled banging out turns at speed through the trees. NEXT: Pow, Punchy Snow, Etc. PS: how to you like your sweet helmet (trooper in white is such a “classic”)? I love the brand – stoked to see that they are now on the US market. Any update on the production model of the 106 F in relation to the envisaged stiffening of the shovels and if and how that affects performance? With regard to the pre-production model you have skied: how does the flex ramp up from the center to the soft tips? Is there any hinge point or is it a flex pattern that consistently gets softer? I think that the old 108 waisted line SFB is a good example of a relatively medium flexing ski with a yet very consistent flex pattern that carved very well and was quite predictable in variable snow for its quite centered mount and moderate flex. I have skied the new rmu apostle 98 several times this season which is quite stiff under foot and has softer tips and shovels (much softer than the regular apostle 105 I have also skied) and there is a hinge point where you pressure the shovel which gave me some violent folding experience if I did not stay quite balanced and centered. Therefore, the question is wether despite the soft tips the wailer 106 F remains relatively predictable or not when entering firmer or variable conditions if you do not push the ski too hard. I would infer from your review that the ski remains predictable, but you often comment expressly on that issue. Thank’s in advance! PS: any plans to get on the wailer 99 F? Thank you for the prompt feedback. Stiffer shovel? Getting (once more) intrigued…As for the sidecut radius, I see your point with the enforcer and I admit that the sidecut radius does not always matter that much (but it can…). With a stiffer shovel this could certainly become a contender for an everyday resort ski in the alps either in the playful charger category or playful ski that can still charge. As for sweet helmets. I still own a 1st generation trooper (PK Hunder edition in gold with an “immature” bikini girl print on the left backside of the helmet) and currently use a 2nd generation rambler – as the former “budget helmet” from sweet – which is now replaced by the blaster. The helmets are reasonably light, have a great fit, low profile, sufficient venting, are compatible with every goggle I was using, feel very solid and have a great design. No reason for me to look elsewhere. Curious to read what you have to say about the MIPS version (it appears it weighs only 30 grams more and if it really offers that much additional protection it is certainly worth considering). I think these skis have been available for purchase for several days now. Did they stiffen the tips already? Just curious since you said they are “going to”. Thanks for your great review,as usual but I do have a question : How do you compare DPS F106 to K2 Pinnacle 105s ? Thinking about grabbing a pair of these 106 wailer pure 3. I currently have a two ski quiver of 185 Nordica enforcer 100 and 185 DPS Lotus 124 pure 3. I am debating on upgrading the enforcers to the 106 (a buddy of mine wants to buy my enforcers). How would you compare the enforcers to the 106? What’s the recommended mount point for a heavier skier (~230lbs)? How do you think these skis would perform with a Telemark binding setup?